While I still love my old Classic Meat Loaf recipe, this lightened-up version from the October 2011 issue of Cooking Light caught my eye so I decided to give it a try. 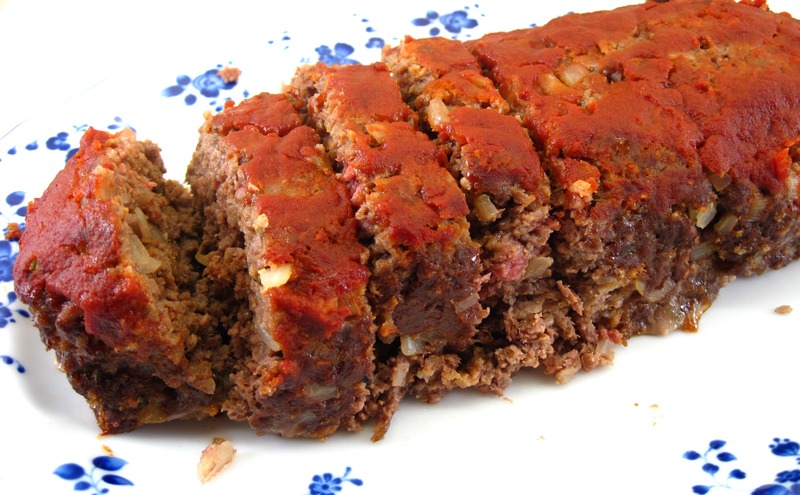 This meat loaf uses ground sirloin; my older recipe uses a combination of ground beef and ground pork. Substituting 1 egg white for 2 whole eggs lightens it up a bit, as does using panko bread crumbs instead of quick-cooking oats. 2. Heat the oil in a small saucepan. 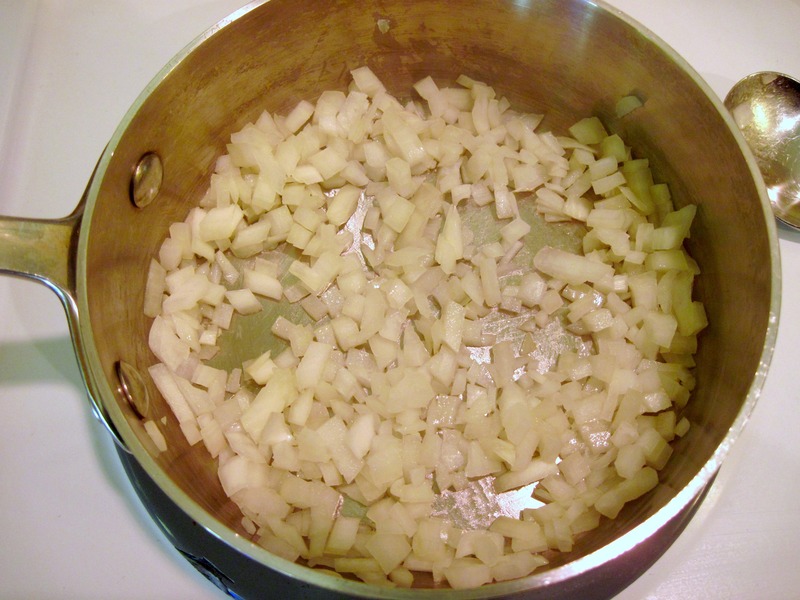 Add the chopped onion and sauté for 5 or 6 minutes, until tender. 3. Mix the onion, 3 tablespoons of the ketchup, and the rest of the ingredients in a bowl. Mix until everything is just combined; do not over mix. 5. Shape the meat on the pan into a loaf that’s about 8 inches long and 4 inches wide. 6. Spread the remaining 3 tablespoons ketchup on top of the loaf. My meat loaf on a foil lined baking sheet. My advice: DO NOT use foil when you make it. The meat loaf stuck to the foil even though I had spread a bit of oil on it. It was difficult to remove. 7. Bake for about 35 minutes, or until an instant read thermometer registers 160˚. 8. Let stand for 10 minutes. (It will slice more easily after this rest period.) Slice and serve. 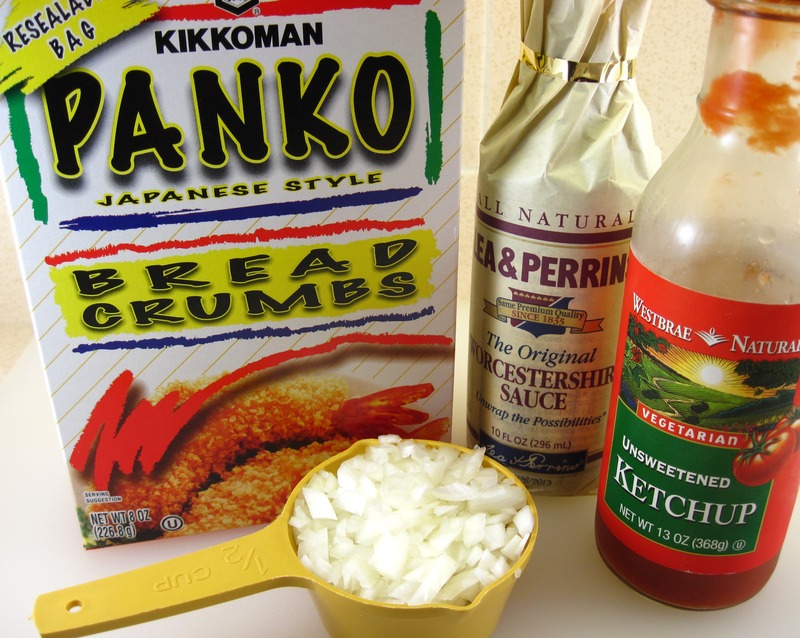 I never thought about using Panko. (They are a much underused staple in my pantry.) Great idea with the egg white as well. I would not have thought of using Panko either. 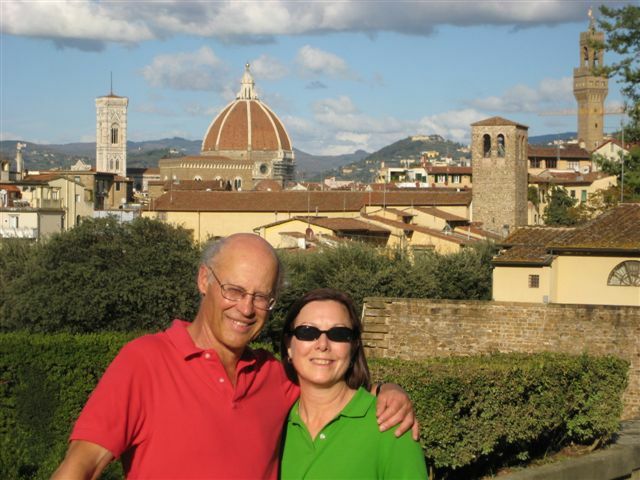 Cooking Light usually does a great job with lightened-up recipes. 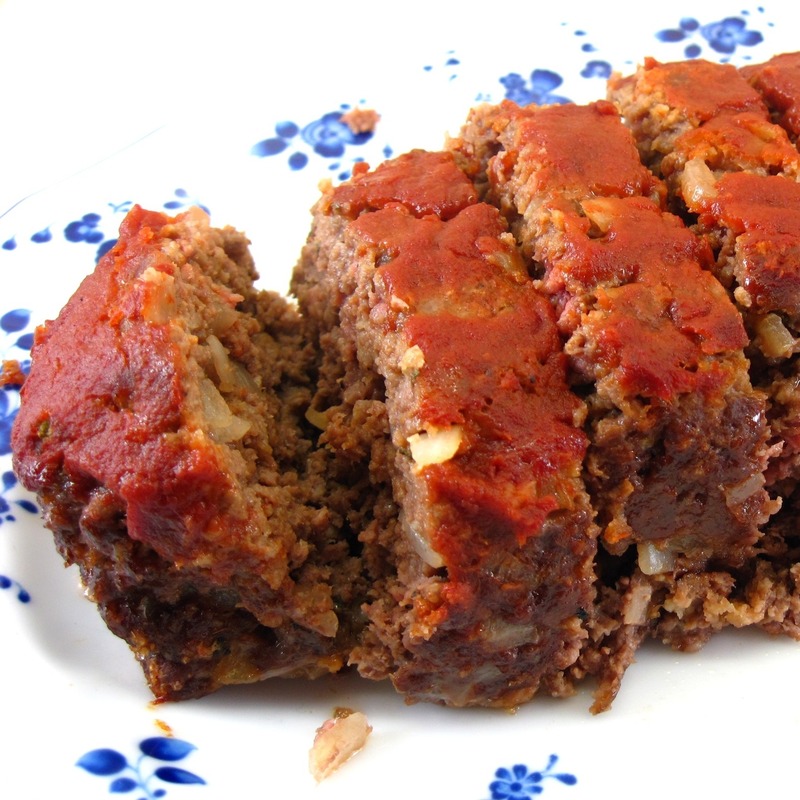 Oh how I love a delicious and juicy meatloaf! I would love to try this one (and the old one) just to say I did! 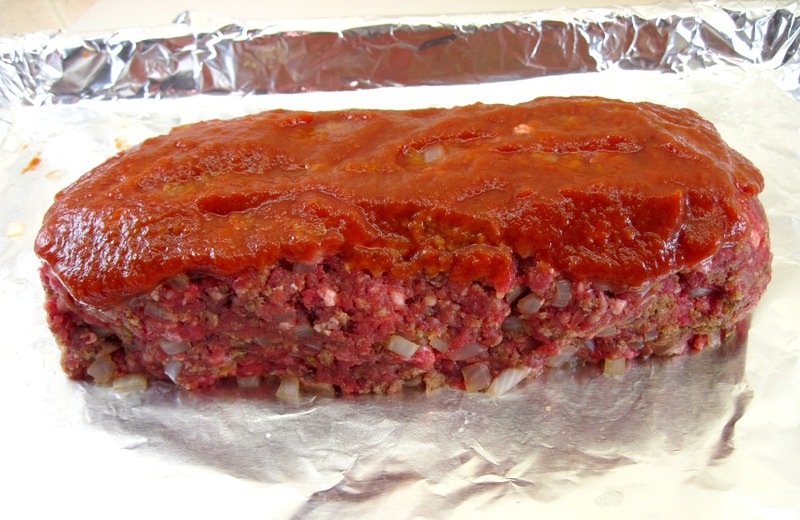 I love using slices of leftover meatloaf as a sandwich meat. Mmmm….I love meat loaf sandwiches, too! Happy Thanksgiving cooking, Dionne! Thanks for the tip with the foil – I wouldn’t think it would stick so much with the grease and oil from the meat. 25 Ugly Foods That Are Beautiful On The Inside « シ最愛遲到. !